Siding Installation - Schedule Service Today | Front Range Contracting, Inc. The decision to repair or replace siding involves much more than cosmetic appearance. In fact, having the right siding can mean lower utility bills, better home air quality, and enhanced weather proofing. If you’re in the market for new siding, give our team at Front Range Contracting, Inc., a call today. Aside from obvious rotting or warping, there are some telltale signs that it’s time to replace your siding. Consider these indicators below as you assess the state of your home’s siding. If your home needs a new coat of paint every five or six years, there might be an issue with your siding. That’s because a good coat of paint should last longer than eight years. If your utility bills always run high and you know your attic is fine, siding could be the culprit. Hot and cold air escape easily through compromised siding. Mold, mildew, and fungi aren’t just an eyesore. They’re also a sign that your siding is letting in moisture and holding it against your walls. When your siding has started to bubble, it’s time for new siding. Bubbles indicate that moisture is surely trapped between your siding and home. The inside of your home can tell a lot about your exterior. If your wallpaper is loose or paint is peeling, you might have a moisture issue coming from your siding. While there are nearly 20 different types of exterior siding, these are the most common you'll find. Consider their advantages and disadvantages as you determine the best siding for your home. If you live in a rainy climate, you want to choose water-resistant siding. This will help to prevent decay and mold growth. The right siding can reduce your home’s utility bills and environmental footprint. Look at the R-value of the material to measure its energy efficiency. The higher the R-value, the better the insulation. Consider how long your siding will last before it needs to be replaced entirely or repainted. If you want a low-maintenance option, prioritize durability. Not all siding is created equal, and not all siding is priced equally either. Have a budget in mind as you evaluate different siding options. If you live in an area susceptible to hail or extreme weather, you want to choose a weather-proof siding. Brick or fiber cement might be your best options. In addition to residential and commercial roofing services, Front Range Contracting, Inc. offers siding installation and repair. From Fort Collins down to Colorado Springs, our team can help you remove, install, and repair siding. Siding installation is much more than a cosmetic fix for your home — it’s a way to ensure structural integrity. There are also dozens of types of siding from which to choose, so it’s important to choose the right one for your home. 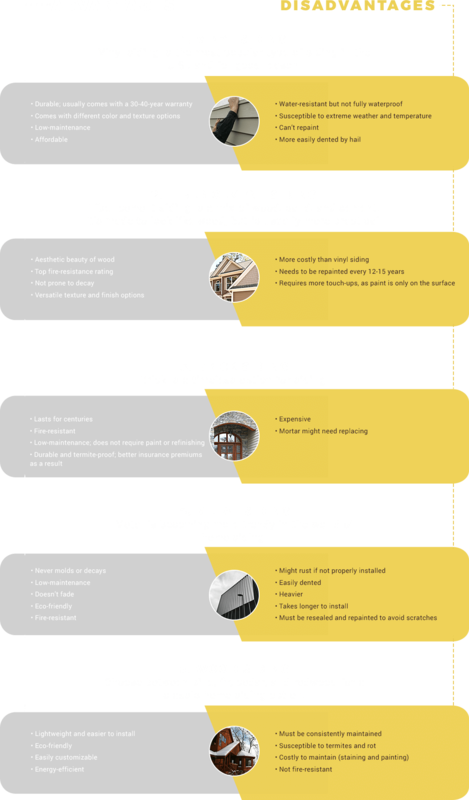 That’s why we’ve created a helpful resource guide below to walk you through the different types of siding available. Benefit from our decades of experience. Schedule siding installation or repair today in Denver, Fort Collins, Colorado Springs, and along the Front Range. Until we see extremely obvious signs of decay or warping, we tend to push siding issues aside. Siding, however, is like any other integral component of a home — you want to preempt any issues before they become more severe. When it comes to siding, there are a few signs beyond the obvious that indicate it’s time to either repair or replace your siding. Without proper maintenance, siding can break, crack, and age to the point of leaking. Once leaks have begun, you risk interfering with the structural integrity of your entire home. Check for these signs to determine whether you need siding replacement. If you’re unsure, you can always call us and we can help you determine whether siding installation makes sense. If you’ve determined that your home could benefit from siding installation, it’s time to figure out which type of siding to install. There are about 20 different types of siding, and choosing the right one for your home can be intimidating. If you want help sifting through siding options for your home, call us today at Front Range Contracting, Inc. With decades of experience in the roofing industry, we can make recommendations based on your home, budget, and preferences. You can also use this helpful resource to get a sense of different siding options and their distinct benefits. In addition to aesthetic preferences, there are a few factors to keep in mind as you choose your new siding. You want to make sure your siding is a combination of form and function — it looks the way you want and it’s practical for your home. Check out this helpful resource of factors to consider! Front Range Contracting, Inc., is the premier roofing contractor along the Front Range. Along the I-25 corridor, our company uses its 30 years of combined experience to provide quality siding installation, roofing, and gutter repair services. Check out our reviews from Google, Better Business Bureau, and Angie’s List to get a better feel for our company’s commitment to you. We look forward to working with you! Call us today to get started.